Veltins-Arena originally named Arena AufSchalke is the home stadium of Bundesliga side, Schalke. Built between 1998 and 2001 at a cost of €191 million the Veltins-Arena is famous for it’s retractable pitch and retractable roof, allowing it to host multiple sporting events without deteriorating the quality of the turf. The Veltins-Arena was built over a period of three years starting in November 1998 and finishing August 2001 with Schalke’s stadium holding the distinction of being the first fully privately funded stadium in Germany at a cost of €191 million. 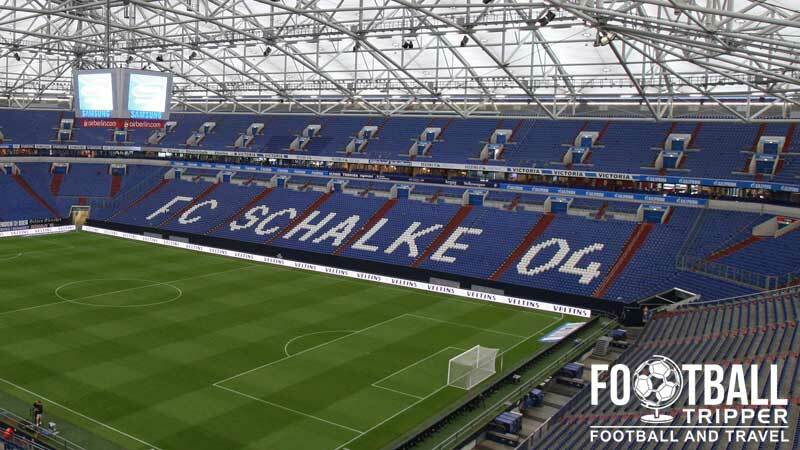 The 60,000 plus capacity stadium was originally known as Arena AufSchalke until 2005 when the Brewery C&A Veltins purchased the naming rights of the stadium on a 10 year deal. The Arena AufSchalke replaced the Parkstadion ground which was a multi-purpose stadium built for the 1974 World Cup, and although the 62,000 (45,000) seating was an adequate size, the facilities were largely outdated. The athletics track around the perimeter of the pitch also hindered the atmosphere at the ground, with the Veltins-Arena correcting all of these previous football sins. Very much like it’s predecessor, the Veltin-Arena was nominated as one of the venues for the 2006 World Cup although due to Fifa’s control over Sponsorship, the stadium was referred to as Fifa World Cup Stadium Gelsenkirchen. The sell out capacity of 52,000 seating saw Schalke’s ground host 4 group matches including Argentina’s 6 nil demolition of Serbia, and most famously the quarter final match between England and Portugal which the three lions predictably lost on penalties, with Wayne Rooney sent off for stamping on Ricardo Carvalho after 62 minutes. Today, the Arena remains one of the most technically advanced stadiums in the world with the University of Phoenix basing their design on the German model with such features such as the retractable roof, slide out pitch and centrally suspended video screen being the envy of clubs across Europe. Schalke’s ground can be broken down into four distinct parts: Veltins-Nordkurve (North), Gazprom Tribune (East), Sudkurve (South) and Ergro Tribune (West). Away fans who make the trip to Schalke’s stadium are predominantly housed within sections V and W in the south-east corner of the stadium. Depending on the expected size of the travelling contignent, more sections of the ground can be allocated. Upon entering the stadium away fans firmly know that they are in Schalke’s backyard with colourful blue seating reflecting club’s main colour. The modern architecture ensure that there are no restricted views throughout, meaning that whether you are sat in the upper or lower tier you will still be able to see the footballing action on the pitch. It’s easy to see why the Veltins-Arena was nominated to host the 2004 Champions League final between FC Porto and Monaco. 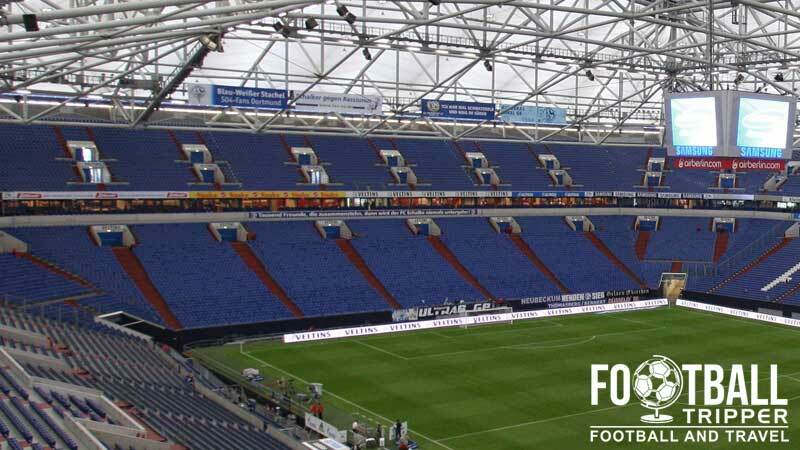 There are a number of football friendly pubs within the centre of Gelsenkirchen which can be visited both before and after the match, however they’re not within walking distance of Veltins Arena. Once you have got the tram to the stadium there’s quite a few outlets around the ground which serve beer including Cafe Del Sol and the club run kiosks. Within the Berger Feld complex there are quite a few commercial areas which have places to eat and drink such as in the South-East corner where there is a Cinema, McDonalds, Burger King and Cafe Del Sol. The Stadium itself has numerous facilities dotted around both inside and outside with the official website stating that there are over 15 small restaurants, 50 grilling stations and 35 cafés. 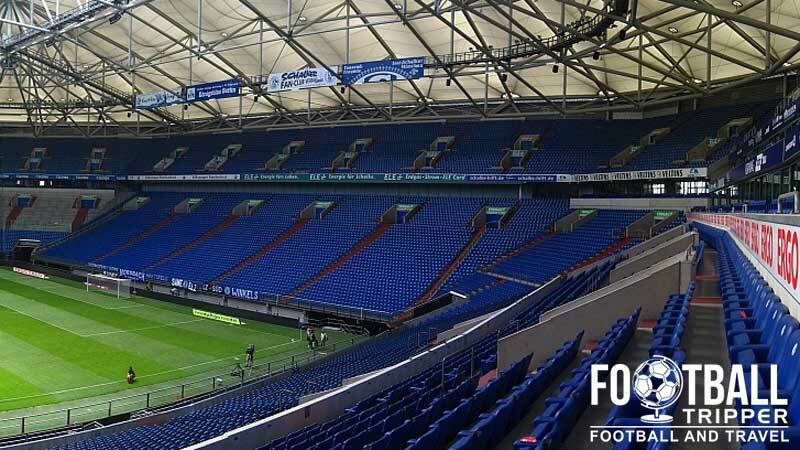 There is even a 5.00 km long beer-line which serves over 52,000 litres of beer per match, and as we’re doing stats, the Veltins Arena also serves up to 2,500 kg of sausage, 7,000 pretzels and 1000m 2 of Pizza per match day! Schalke 04 operate 5 shops in addition to their official online store. The main one is located inside Veltins Arena and is supplemented on matchdays by over five kirosk and four mobile sales units. For a full list of FC Schalke 04 club shops and their respective opening times please List of Schalke Shops. The welcoming exterior of Schalke’s club shop within Centro Shopping Centre. Located 16km West of Schalke it’s not the most convenient place to visit! Schalke 04 offer fully guided tours of the AufSchalke Arena, which last 75 minutes. Once you have finished taking in the remarkable stadium, you can pay an additional €5.00 to enter the Schalke-Museum and fill in any gaps in your knowledge of the football club. 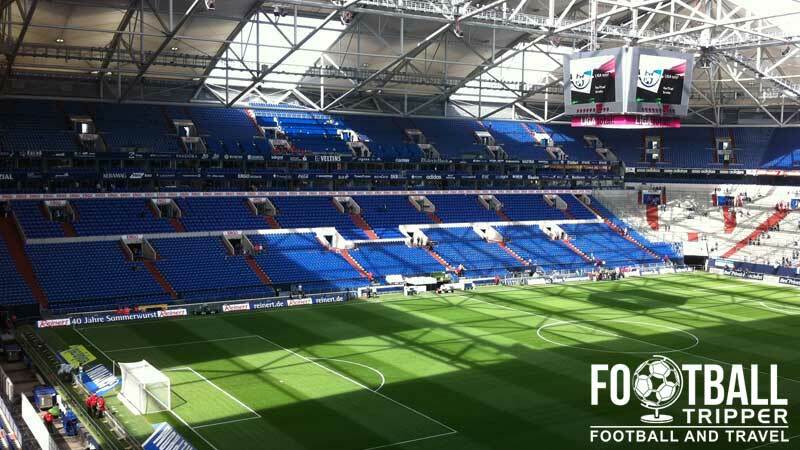 Tours cost €9.00 for adults tend to run from Tuesday through to Sundays but may be cancelled if there is a match or other event such as a concert at the Veltins-Arena on the same day. The museum is also open on the same days, usually from 10.00 am- 6.00 pm, although it closes an hour earlier on Sundays and in the Winter months. For more information you can either phone +49 (0) 209/3618-900, email [email protected] or visit the official website for the most up to date information. Tickets to see Schalke play can either be purchased online, via phone +49 (0) 1805-150810 or at one of the numerous S04 Shops located throughout the city and wider Gelsenkirchen area. Be warned that Die Knappen (The Miners) generally sell out their home matches which means that you will not be able to leave your ticket purchasing to the last minute, and you will have to book in advanced. 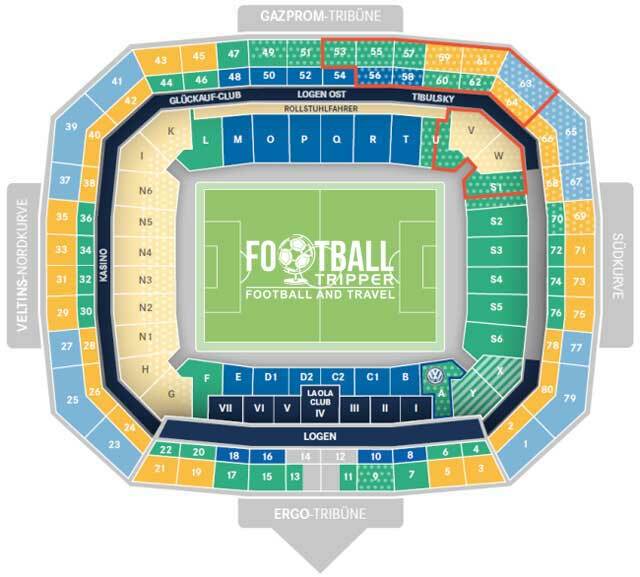 Ticket prices start at around €15.00 euros for a place standing on the terraces, and anywhere between €26.00 (Upper Tier behind the goal) and €52.00 (Central seat) depending where you sit. The Veltins-Arena is located in the Berger Feld which is sometimes regarded as the Geographical centre of Gelsenkirchen. Veltins Arena buzzing before the match, plenty of Blue on display. Note Gelsenkirchen is the town the football club are based, and not Schalke. Schalke isn’t a town! Those looking to drive are in luck as the stadium can be reached via two highway exits either from the North A-2 (Exit 6 Gelsenkirchen-Buer) or from the South A42 (exit 17 – Gelsenkirchen-Schalke). Once in the city, follow signs to the stadium with Kurt-Schumacher-Straße being the main road which surrounds the Eastern perimeter of the stadium. The easiest places to park are probably on “Willy-Brandt-Allee” where the cinema complex and McDonalds is and “Adenauer Allee” which is adjacent to the Kurt-Schumacher Straße. The best way to travel to Schalke’s Stadium is via Tram from Gelsenkirchen main railway station. Located underneath the train station (Gelsenkirchen Hauptbahnhof) you can catch line 302 heading towards GE-Beur which will take you to the Veltins-Arena stop, taking no more than about 15 minutes. One of the many new Schalke Trams which can be seen throughout the city. The closest airport to Gelsenkirchen is either Düsseldorf or Dortmund International Airport at approximately 40 and 46 km distance away respectively. Düsseldorf is the third largest airport in Germany after Frankfurt and Munich, and is the largest flight hub in the North-Rhine-Westphalia region, whereas Dortmund has carved out its identity through low cost airlines. Both airports have good ground transportation with the journey to Gelsenkirchen likely to take you less than 1 hour whether it is via bus, coach, train or tram. Within the Burger Field where the Veltins is located there are two hotels which may be worth looking at called Courtyard Courtyard Gelsenkirchen and Green Olive Gelsenkirchen, although you’ll likely have to book way ahead in advanced to secure a room for the night. Further south of the stadium’s complex you have the Arena Hotel, but besides this you’re much better off looking for accommodation nearer Gelsenkirchen city centre.